See the sites and explore Lake Mead at your own speed! 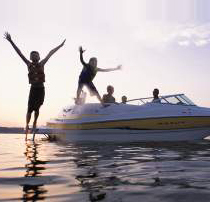 Enjoy a day on our great lake and rent a boat from Las Vegas Boat Harbor. Go for a picnic, take a cruise, try wakeboarding or water skiing, have fun on a tube, or go hit the water on a Yamaha Waverunner. Enjoy the warm water and explore great sites, including nearby Hoover Dam, the dozens of secluded coves, the variety of beaches, and much, much more!!! Call us at 702-293-1191 to schedule your next adventure today! • PAST EVENTS - CLICK HERE - Learn about many of the great past events that have been hosted by Las Vegas Boat Harbor and Lake Mead Marina. Since 1957 Las Vegas Boat Harbor has been family owned and operated by the Gripentog Family. 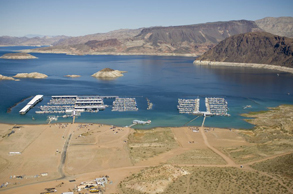 The marina is the largest privately owned marina in the United States, with just under 1500 slips in the Hemenway Harbor of Lake Mead. 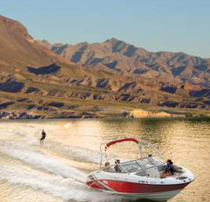 We pride ourselves on offering the best marine services on Lake Mead and throughout the west. 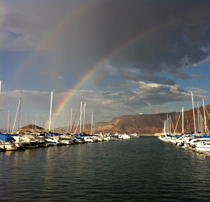 Spend a day, weekend or week on Lake Mead. Boat and waverunner rentals, long and short term in-the-water slips, floating restaurants and lounges, marina store, long-term dry storage, marine repair and maintenance. Las Vegas Boat Harbor, Inc. is an authorized concessioner of the National Park Service.